You chose a great weekend to visit! I missed that last Critical Mass but from what I’ve heard it was a really good one, glad you enjoyed it. £10 for a week is a bargain for a Brompton too! Thanks for your comment Phil. There was such a big turnout for Critical Mass, loads more than the last one I was told. I’d definitely do it again if I get the chance. Can’t say enough good things about the Brompton scheme, it’s worth having a go if you just fancy trying one out. You know, I never actually knew about that bike hire… what a great idea. And what a lovely way to see the city too. I know it’s only been going since March, so I hope the word is starting to spread. We got a fair bit of attention at Critical Mass and sounded like proper brand ambassadors by the end of the event. 😉 I definitely want to do it again and bring the camera, there’s so much of greater Manchester to explore and such a contrast between urban and rural. 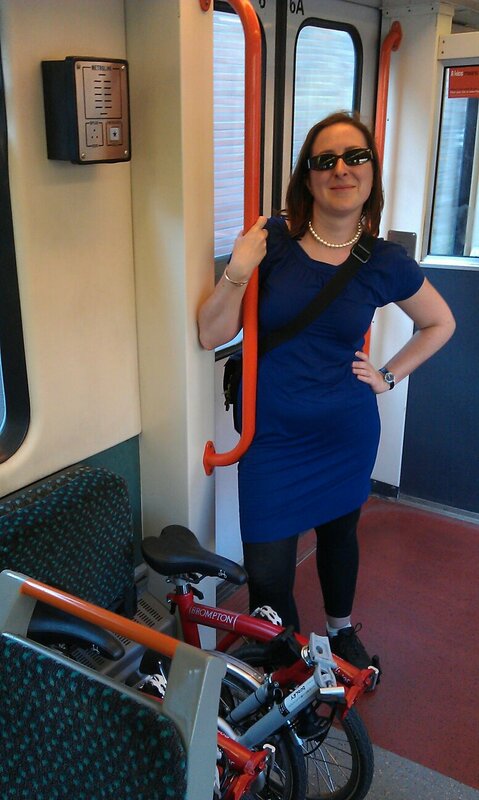 Interesting that you were allowed on the tram without putting the brompton in a bag…..Technically folding bikes are still against the Metrolink bylaws. Thanks for stopping by Steve. We were warned that inspectors might insist upon putting them in bags, but I guess we got lucky, as we didn’t see any inspectors on our tram at all. Some folks have said they carry around a bin bag with them for such instances, I’ll have to do that next time. I commute in to Manchester from Stoke everyday with Brompton. I carry a wheelie bin bin bag just in case i need to use the tram. Although since they changed operators and now they are operated by RATP (Paris Metro operator) they seem to have become more folding bike friendly. Maybe it was the Brompton adverts on the trams. Interesting that Brompton Dock are opening in Stoke the Virgin trains Brompton hire scheme in Stoke bombed. Good to see the word is getting around. The bike scheme is also more flexible than bike sharing, and regular users are encouraged to take bikes out on long term hire, as unlike the Barclays bikes the prices come down the longer you keep the bike. This of course means that another bike can be put in the locker and hired out. The first manual pilot scheme was launched in May 2009 – several months ahead of the Barclays scheme, but quietly with 50 SW Trains season ticket holders, and around 100 bikes have been on long term hire from Waterloo building up operational experience. The first automated unit is in Guildford, and due shortly to be upgraded to the Manchester (production) standard. Next week should see the Stoke on Trent launch, and there follow around 20 other locations, noted on the website. Already some employers and large institutions are looking to offer free membership or even free use of the fully serviced bike as an incentive to give up a car park space on their sites. One large West London HQ reckons that for every employee who does not require a parking space on site they make a saving of around £9000/year, and just the other day I learned that for a Home Counties regional hospital site, the provision of an expanded (multi storey) car park costed at the very minimum of £12,000/space* to construct would need to be charged out at just under £7 per space per day to cover amortisation and operating costs over a 25 year write-down – a Brompton Dock bike on long term hire costs under £1.70 per day to the user, and that includes an element of revenue to the host site. Hence a likely appearance of these bikes in corporate branding at large workplaces, business parks, universities, and NHS sites. *Currently my record price per parking space sits with Penrith Station, where a second level of car parking has been built over the existing car park to add just 30 more spaces at a cost of £2.5m – or £83,333 per space, at least it seems to be filling up, unlike Preston and Wigan (c £23,000/space), where prices have been cut by 40% to get the spaces filled. Do post me details of your empty car parks – it is a growing national trend with car use reducing since 2007. Amazingly London 2012 turned down the option of having Brompton, or Pashley (the only remaining UK volume bike producers) as the supplier of bicycles, instead opting for a package of BMW cars with ‘BMW’ bikes, which, are a rather ugly looking hard-tail MTB which do not even carry a maker’s branding or London 2012 logo (almost as if the bikes are an embarrassing but necessary requirement). What we could have done with a legacy of re-useable utility cycles to local bike hire schemes carrying their branding of London 2012 into their new uses. Those are some interesting stats Dave, thanks for sharing. I hope Brompton Dock continues to be successful and expand. Glad to hear their Stoke-on-Trent launch is imminent. Having been picked up at Penrith station not too long ago, I can safely say that the car park gets quite full there. I’m surprised London 2012 turned down the chance to have a fleet of Pashleys or Bromptons, as that certainly would have helped both brands’ marketing. Perhaps they were following the look of the Boris bikes–functional and less desirable to steal. That’s total speculation on my part though. There may have been an element of not being able to scale up production for a whole fleet – the Pashley factory must be quite limited in terms of how many bikes they can make a day what with each bike being assembled by hand. It’d also have been a rather expensive fleet to purchase! A collection of Pashleys with Union Jack livery would look absolutely fantastic though!